Ryan “The Flash” Garcia (14-0, 13 KO) hosted a media workout today at Legendz Boxing Gym in Norwalk, Calif. ahead of a very special May 4 edition of Golden Boy Boxing on ESPN at StubHub Center in Carson, Calif. Garcia will kick off the Cinco de Mayo festivities as he faces seasoned Puerto Rican contender Jayson “La Maravilla” Velez (26-4-1, 18 KOs) in the 10-round main event in the super featherweight division. ESPN2 and ESPN Deportes will air the fights beginning at 10:30 p.m. ET/7:30 p.m. PT, and stream live on ESPN3 starting at 9:00 p.m. ET/6:00 p.m. PT. Undercard fighters of the Golden Boy Boxing on ESPN show were also in attendance. Seniesa “Super Bad” Estrada (12-0, 2 KOs), who will return in an eight-round flyweight fight. 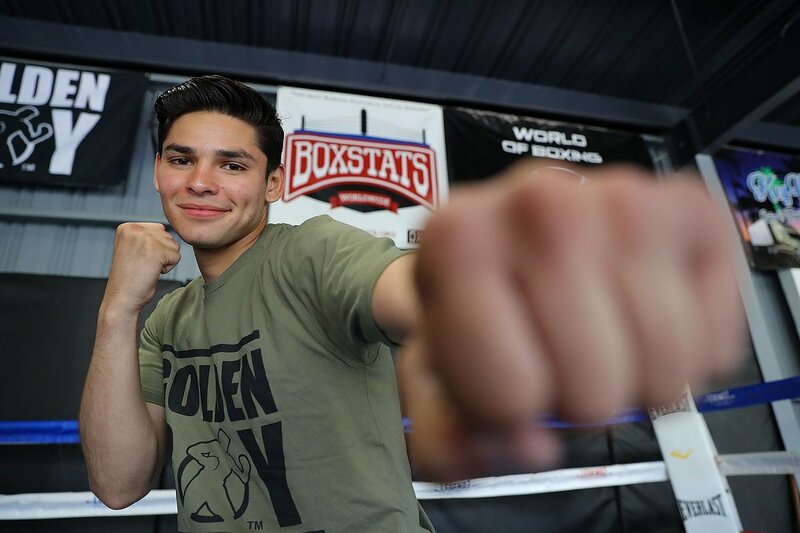 Marvin Cabrera (7-0, 5 KOs) will participate in an eight-round super welterweight clash. Garden City, Kansas’ Richard “Kansas Kid” Acevedo (1-0, 1 KO) will fight in a four-round super welterweight battle. Azat “Crazy A” Hovhannisyan (14-2, 11 KOs) also participated in the media workout today. Hovhannisyan will challenge Rey Vargas (31-0, 22 KOs) for the WBC Super Bantamweight Title in the co-main event of spectacular card at Turning Stone Resort Casino on Saturday, May 12. The event is chief support to the 12-round co-main event to Sadam “World Kid” Ali andLiam “Beefy” Smith for the WBO Junior Middleweight World Championship. The doubleheader will be televised live on HBO World Championship Boxing beginning at 10:00 p.m. ET/PT. Ali vs. Smith is a 12-round fight for the WBO Junior Middleweight World Championship presented by Golden Boy Promotions in association with Frank Warren. Vargas vs. Hovhannisyanis a 12-round battle for the WBC Super Bantamweight World Title presented by Golden Boy Promotions inassociation with Promociones del Pueblo.The event is sponsored by Tecate, “THE OFFICIAL BEER OF BOXING” and Casa Mexico Tequila. The doubleheader takes place Saturday, May 12 at Turning Stone Resort Casino in Verona, New York and will be televised live on HBO World Championship Boxing beginning at 10:00 p.m. ET/PT. Tickets for Garcia vs. Velez are on sale now, and are priced at $75, $50, $25 and $10, plus applicable taxes, fees and services charges. Tickets can be purchased at goldenboytickets.com, AXS.com, by phone at 888-9-AXS-TIX (888-929-7849), and at StubHub Center Box Office (Monday through Friday from 10 a.m. PT to 6 p.m. PT). VIP Suites are available by calling 877-604-8777. For more information on group discounts or VIP packages, call 877-234-8425.